Recently, we did an object lesson called “the Wall” in chapel. We talked about how bad things happen in this world despite having a loving God that looks over us. We make bad choices at times that hurt us, and others make bad choices at times that hurt us. In general, there is a lot of heartache and brokenness around us that causes a lot of hurt and a lot of people to want to hurt others. So, I told the children, we learn how to protect ourselves. 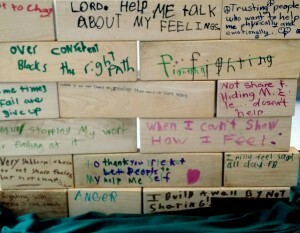 Just like castles walls or the strong walls of our cottages on campus, we build walls around our hearts. 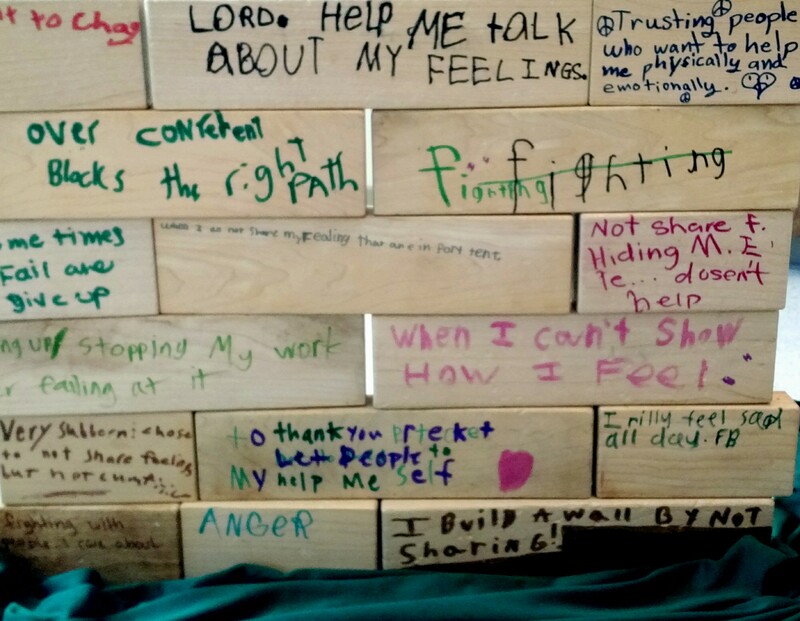 While we still feel hurt from time to time, by building a wall and keeping people out of our hearts and away from how we are really feeling, we stay safe. We survive. Then, I told the children, something happens. We find someone that we want to let into our hearts. They show us love and care and grace in ways we hadn’t experienced from others. But, you know what the problem is? [The children instinctively knew, because this has been their experience!] The walls we used to protect us from bad things getting in and hurting our hearts more also keep good things out. We can’t let our parents, or our teachers, or our friends, or our counselors… whoever it might be… into our hearts to see them as they really are: hurting, broken, but desperately wanting love and acceptance. So, we might get frustrated that the wall keeps them out, and they might get frustrated too, because they see our need and want to meet it, but can’t ever get in. So, maybe it all turns out awful. Maybe that person we want to let in gets so fed up being on the other side of the wall that they leave… and we hurt again and tell ourselves: “Well, that was dumb of me! I just thought about taking my wall–my defenses–down, and look what it got me. Nothing but more hurt and pain.” So, we build another layer to the wall… we make it thicker and stronger. This seems like a real story, doesn’t it? Maybe this is your story? But, as I told the children, there is another story, that if considered, just might make all the difference. That story is the story of God’s love shown to us through Jesus. Jesus came to show us a better way. It was so important to him that we understand God’s love that he was willing to be put to death by the angry people that couldn’t accept what he was saying about God! And, miracle of all miracles, Jesus rose from the grave on Easter morning, giving us hope that nothing ever has to separate us from God’s love. But, what about that wall? If nothing can separate us from God’s love… that wall is going to have to come down. We can start by letting Jesus in, and together, working with God to remove the wall brick by brick until we can let others in, too. We built the wall, but it’s too strong for us to tear down on our own. We need help. We need God’s help. And, God wants to help us, but we have to ask him. By this time many children were nodding their heads. This made sense. They understood the walls they had placed in the way for God and others to come in and bring healing to their heavy and hurting hearts.